On Saturday Night of Semana Santa (Holy Week), the YWAM (Youth with a Mission) got busy with another outreach for the week. They had two teams in operation during the week. Each doing Street Dramas and other ministry related events. 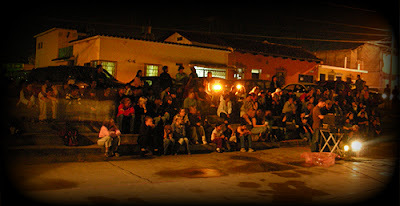 This particular outreach was a street concert with a local Christian band out of San Lucas, dramas, testimonies, and and invitation. One of the testimonies was a friend to IDC and our home church PCC, her name is Nora Greenwald. Her professional performance name is "Molly Holly" from the WWF - Women's Wresting Federation. Her testimony was incredible. 4 people made professions of faith that evening. At least in one part of Antigua the gospel was heard during Semana Santa. The spiritual warfare ran high.